FRASCAL provides highly talented and motivated doctoral researchers with the opportunity to gain a broader, interdisciplinary knowledge in the fields of particle- and continuum-based modelling and simulation techniques to capture, describe, and predict multiscale fracture of complex materials. Thus, FRASCAL offers a structured and comprehensive interdisciplinary qualification and supportive supervision programme together with transparent organisational structures and processes to ensure extensive support of each doctoral researcher and thus successful as well as timely completion of the planned doctoral projects. Vital parts of this concept are (1) the installation of interdisciplinary mentoring teams, (2) a dedicated lecture and seminar programme, and (3) a transparent credit point system for the accompanying quality control. Offering awards for the best graduates of the RTG further stimulates excellence in research. 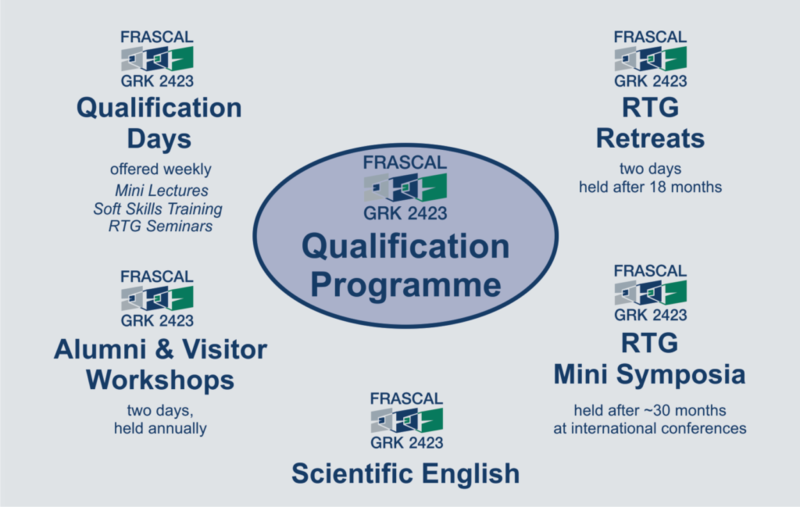 FRASCAL’s qualification programme comprises “Qualification Days”, “Alumni and Visitors Workshops”, and “RTG Retreats” as basic activities. These are accompanied by participations at international conferences and optional research stays abroad. Based on a credit point system, each doctoral researcher will attend a minimum number of these activities during the doctorate. Averaged over three years, the resulting work load corresponds to approximately 2 SWS (Semesterwochenstunden – semester hours) per semester. Each year, the doctoral researchers attend approximately seven qualification days covering mini lectures, soft skills trainings, and RTG seminars. Distinguished qualification days are concluded by social events to encourage close exchanges among the doctoral researchers and the mentoring teams. Once a month, an RTG lunch is offered and provides a casual atmosphere to discuss in a relaxed way any organisational, administrational, and topical issues related to the RTG. In each lecture period, mini lectures are offered during the qualification days. Each doctoral researcher chooses appropriate mini lectures from the fields of (A) Mathematical Skills, (B) Modelling Approaches, (C) Computational Methods, as well as (D) Material Sciences Background. Soft skills seminars are offered and comprise trainings in the rules of good scientific practice, in gender equality in research, on the collection, storage, editing and sustainable provision of research data, on scientific writing as well as on professional presentation techniques. Regarding individual career planning, the course programme is accompanied by seminars focussing on the employability in industry. Two qualification days per year are reserved for an RTG seminar. There, the current developments of each doctoral project are presented and social activities complete these seminars. The annual alumni and visitors workshop enables scientific exchange with external experts and shall thus stimulate intense discussions. FRASCAL’s Mercator fellows as internationally highly recognised and experienced experts participate together with additional visiting researchers from the fields encountered in FRASCAL, but also from other related research fields. In a later stage of the RTG, members of former cohorts (alumni) will be invited to report on their current scientific work and careers. These two-day seminars are held at secluded venues outside the FAU campi and are accompanied by social activities to enable informal get-together. For each cohort, an RTG retreat is held after approximately 18 months. There, the doctoral researchers report on their scientific activities and the mentoring teams assess the individual scientific progress. The RTG retreats are held as two-day seminars at secluded venues outside the FAU campi and are accompanied by social activities to enable informal get-together. International conferences are important for scientific exchange and may thus stimulate intense discussions on, e.g., the progress and the current state of the RTG. Hence, each doctoral researcher is encouraged to attend international conferences. In addition to the RTG retreats, RTG mini symposia within dedicated international conferences are organised by the doctoral researchers. The RTG mini symposia are scheduled such that they are held in the final phase of each cohort. Publications in international journals, presentations at international conferences, and scientific exchange with international researchers require profound knowledge of scientific English. A professional English language coach will be available for the doctoral researchers to train oral presentations, to proofread English publications, and to give English classes.